As authors, we are all passionate about something. For many of us, it’s our dedication to a specific topic that motivates us to sidestep life’s daily distractions (TV, Internet, etc.) and sit down and write. From an author who has skateboarded across America THREE TIMES to a designer whose love of illustration compelled her to publish over 100 conference talks as elaborate sketchnotes, these two Lulu authors are a testament to true passion. This book was written by those for whom the ride is never-ending: by the 15-year-old grom who falls asleep dreaming of skateboarding; by the 40-something “pad dad” you see at the local skatepark; by the women whose stories have never been told; and by the 73-year-old architect who didn’t begin skateboarding until the age of 65. Over 170 stories and 200+ photographs. What made you decide to self-publish instead of going through a traditional publisher? Since it was my first attempt at putting together a book of my own and really don’t know how the traditional publishing system worked, I decided to give Lulu a try. Previously I had done the layout for a friend’s book that he published on Lulu. I found Lulu very easy to work with. I also thought that by self-publishing, I would have greater control over the content. Where does your passion come from to both skateboard across America (three times) and write a book? The passion for skateboarding across America came from three very different places during three very different times in my life. In 1976, I was 19 years old, living in Morro Bay, California where pretty much the only job for a teenager was working in restaurants, which I had my fill of! 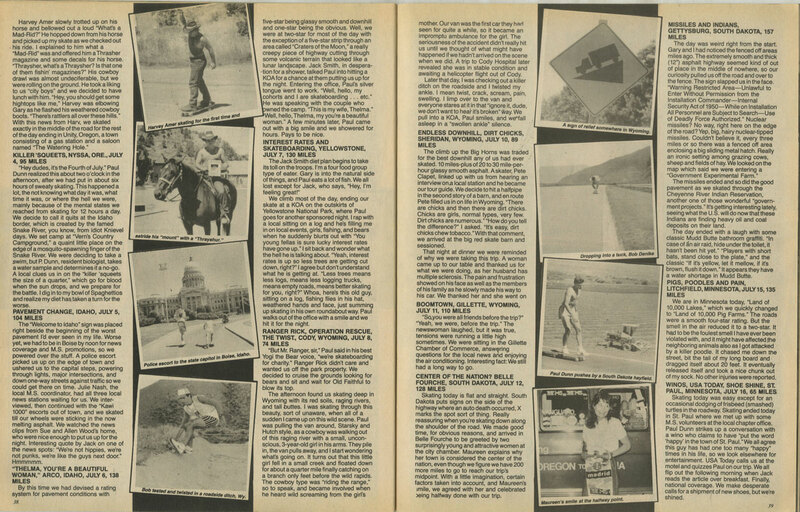 1976 was at the beginning of the urethane era of skateboarding, and I was looking for a way to make a name for myself. One night a group of us were hanging out and someone jokingly threw out the idea of skateboarding across America, within a few minutes the talk turned serious and we decided to give it a shot. I sent a letter to Roller Sports, a wheel manufacturer in Florida asking for sponsorship. A couple of weeks later they responded with a yes and a month later we were underway. We had no idea what we were getting ourselves into. Heck, we even took a .22 rifle with us, after all we would be skating across the wild west. This was during a time when a long distance phone call was still a big deal; we would call home every few days, with one set of parents relaying our progress to the others. We might as well have been on the moon. We made the crossing in 32 days. The second trek came about through the urging of some younger friends who had heard all the stories about the first crossing. We decided to do the trip as a fund raiser for Multiple Sclerosis. We had great sponsorship, including a van from Chrysler that we scored when one of the team members, Paul Dunn, wrote a letter to Lee Iacocca. The equipment was quite a bit better than the first time, allowing us to finish in 26 days. 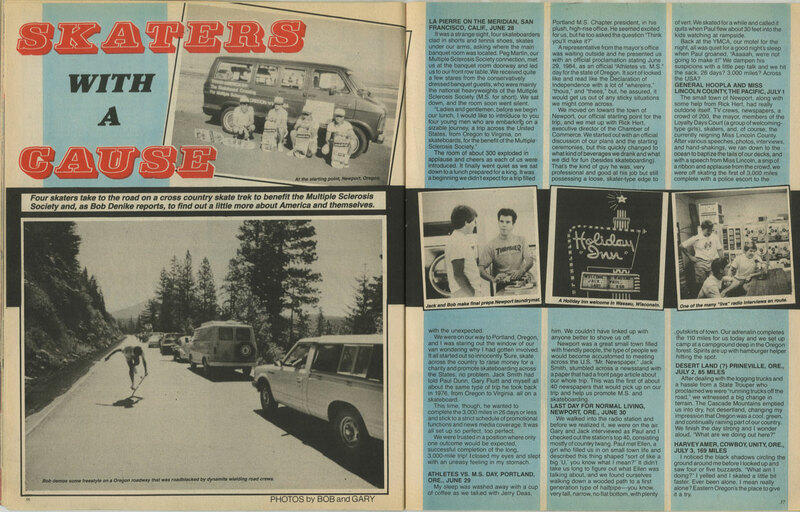 (Thrasher Magazine wrote an article on the 1984 trip, click the following links for shots from the magazine: part 1, part 2, part 3). The third time was very personal. In 1988 my son, Jack Marshall Smith, was born with the very rare Lowe Syndrome (about 350 known cases worldwide). When he was born we were told he wouldn’t live past two, he fooled them all and lived to be 14. He was an incredible boy and taught me so much about life. In May of 2003, he passed away from complications due to Lowe Syndrome. Being so rare, there is not much in the way of research funds for Lowe. I decided to skateboard across America with three friends to raise awareness and research funds. The internet allowed for us to get our message in front of a great number of people and companies who ended up supporting us. We were able to raise thousands of dollars for research, and to also let people know about Lowe. One of the best things that came out of this trip is that it inspired other people to make long distance rides, many of whom used their treks to benefit the Lowe Syndrome Association. We made the crossing in 21 days, due to great equipment and some training before the trek. As for the passion for writing the book … I started out thinking I would publish a book of my own stories I had written over the years. The more I thought about it, the more I realized there were lots of skateboarders who had stories to tell. I decided to open up the book to anyone who wished to contribute — mainly I was interested in the “everyman/everywoman” skater, not the pros or famous skaters. The pros and other skate notables that are included are for the most part those who I have a personal relationship with. When I made a few postings on Facebook and skateboarding forums the floodgates opened, and as you can see I ended up with over 150 skater written stories from around the world, from all ages of skaters. Why do you think it’s important for people to write about their passions? I think it allows a truer story to be told than if someone’s story is told by another. Sure the writing may not be as eloquent, but the emotion and feeling is much greater. At first, we were trying to edit each story to be grammatically correct; we soon realized that we were almost stealing the skater’s voice by doing so. We decided to keep the editing light, so that the person’s story would be told in their own words. It takes a long time to complete a 325 page 8.5 X 11 book. Would you say it was your passion for writing/story telling or skating that helped you complete it? At first it was my own passion to write a book, the original title was My Life on Board. When I opened up the book to contributions, I changed the name to Lives on Board. As I began to receive and read the contributions, their passion became my passion. I felt compelled to finish the book, so their stories could be told (especially the stories by women, who have long been ignored by the skateboarding world). What started out as something I thought would take a couple of months to put together, ended up taking a year and a half. I actually received the first printed copy at a hotel room in Carlsbad, California (home of the first commercial skatepark), where I was attending an old skaters reunion. Be sure to check back in next week for part two with Eva-Lotta Lamm, author of Sketchnotes 2009 & 2010. Jack is a true inspiration for the sport of Skateboarding. Jack contacted me out of the blue to write a story for his book. I did not know Jack at all-he got my name off Ebay I believe it was. And so when he contacted me I felt honored to write a story about my skateboarding life. And I read the stories of others in this book and it is amazing how skateboarding touched the lives of so many people-read the book and you will be amazed.